Pelicans at Denmark is located on the banks of the Wilson Inlet in the quirky town of Denmark famous for its’ arts community, pristine beaches, walking and bike trails not to mention the multi award winning bakery and wineries. Pelicans property is five minutes by car from Ocean Beach and Lights Beach in one direction and Denmark shopping precinct in the other. Denmark is perfectly located for exploring the region – Albany is 56km to the East and Walpole is 73km to the West with the Porongorups 73km to the North East making day trips an easy and convenient opportunity . Golfing: Keen golfers can enjoy the Denmark Country Club which features a challenging 18-hole golf course, a newly installed undercover driving range and a spacious modern clubhouse. Conveniently located within walking distance from the centre of town, the Country Club offers a place where visitors are welcome. Clubs can be hired from the Denmark Visitor Centre in town. Walks: From the entrance to the Pelicans at Denmark driveway, turn left for a ten minute walk to the beautiful Poison Point lookout, or follow the path all the way out to Ocean Beach (approx. an hour each way). Alternatively, turn right and stroll along the scenic pathways past the Rivermouth Caravan Park with its’ colony of Pelicans then along the banks of the Denmark River into town (approx. 30 minutes each way) for a freshly roasted coffee. The world famous Bibbulmun Track can be accessed less than five minutes from our property and there are many other walks in the area. Bike Trails: The shared bicycle/walking path is right at Pelicans front entrance and the Munda Biddi Trail is a five minute ride toward town where access to the Denmark Heritage Trail means you can ride on off stunning road trails either in the direction of Walpole or Albany. Swimming, surfing, wind surfing and kite surfing can all be enjoyed at one of the many amazing beaches in the area. Greens Pool is a mere fifteen minute drive from Pelicans at Denmark and a visit there isn’t complete without a stop at the Honey Meadery afterwards for a taste of their delicious ice cream. The numerous and beautiful waterways can be enjoyed by kayakers, canoeists and boating enthusiasts with kayaks, and boats available for hire from the Rivermouth Caravan Park. Take the Denmark River Cruise at Sunset on the covered houseboat style launch and see the river and inlet. Stroll around town and visit our galleries showcasing the best of our local artists, enjoy a wonderful breakfast or relax and watch the world go by whilst sipping your choice of freshly roasted coffee or a freshly brewed tea from one of our speciality cafes. Soak in a spa bath and enjoy the views. 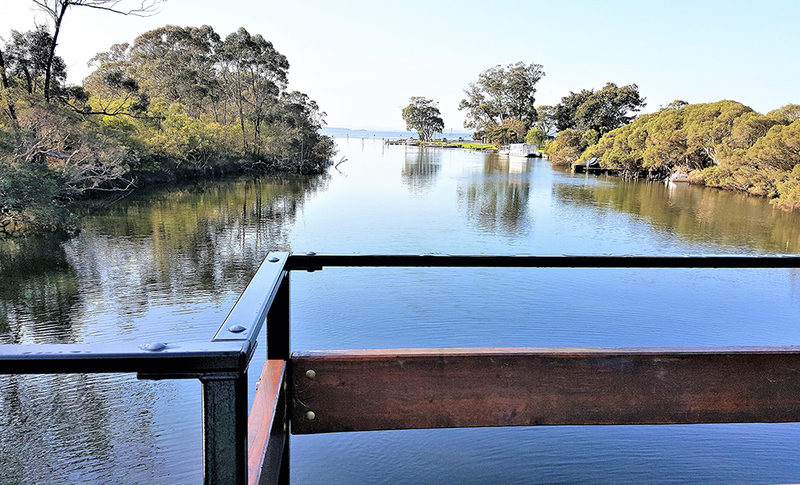 Relax on your deck and do absolutely nothing whilst looking out at the beautiful bush and waterway facing Pelicans at Denmark.